After the 99 degree weather in Japan, travel to Iceland called for wooly socks and a winter hat. 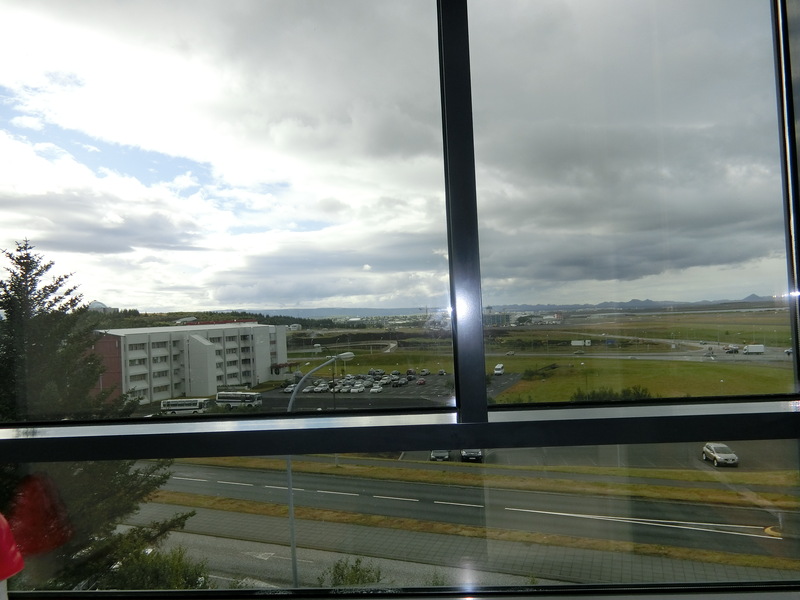 During my first day in Reykjavik, I met with Dr. Drífa Björk Guðmundsdóttir, a psychologist who served as her country’s delegate at the first global summit on psychosocial pediatric care in 2014. 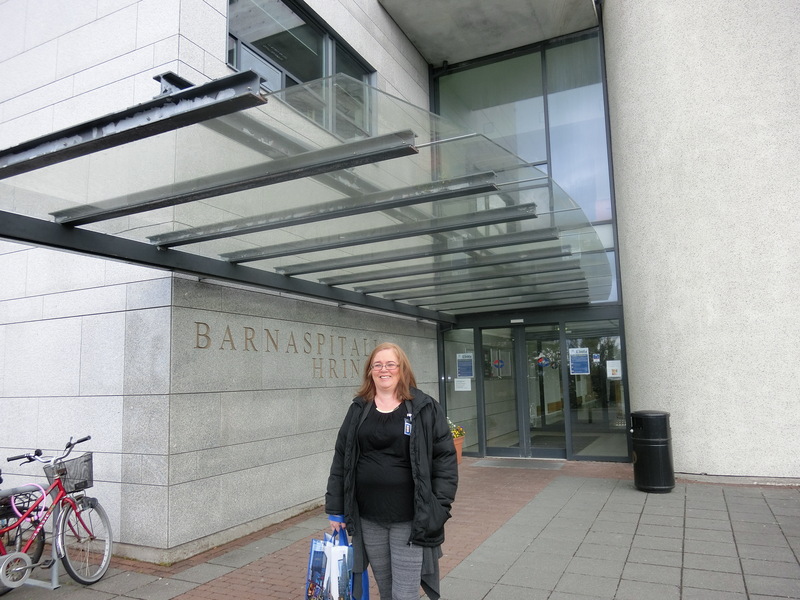 She hosted me at Landspitali, the National University Hospital of Iceland. Our morning together included a tour of the pediatric inpatient unit, physical therapy department, clinic and NICU, and an hour spent in conversation with some of Dr. Drifa’s colleagues, a physical therapist, hospital play specialist, nurse, nurse manager and social worker from a non-profit agency that serves hospitalized children and their families. 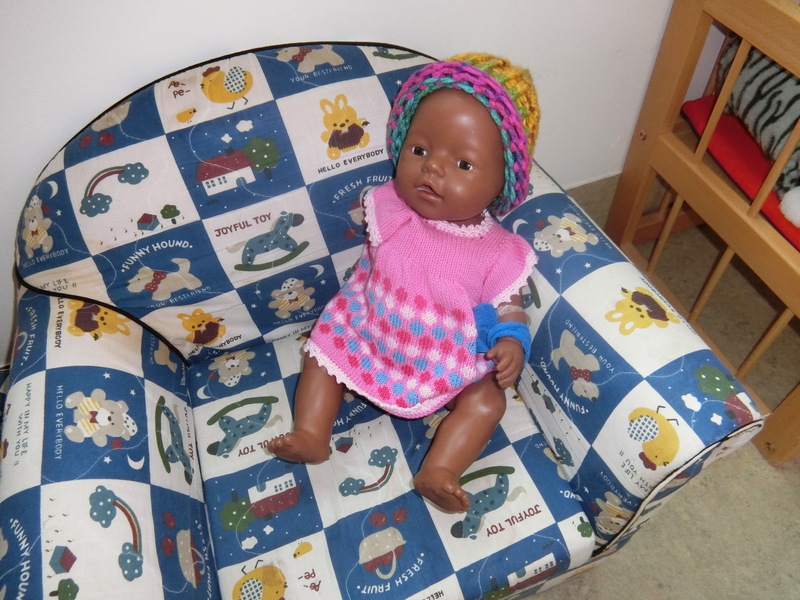 We discussed best practice for helping parents support and prepare their children for hospitalization. It was clear to me that these professionals held many of the same values and goals for supporting children that we have in the US. I enjoyed our conversation tremendously, but I must admit, I treasured my time with Sigurbjörg Guttormsdóttir (thankfully nicknamed Sibba, but pronounced “Sippa”!). Sibba is one of the two hospital play specialists, and she has worked at the hospital for 25 years. 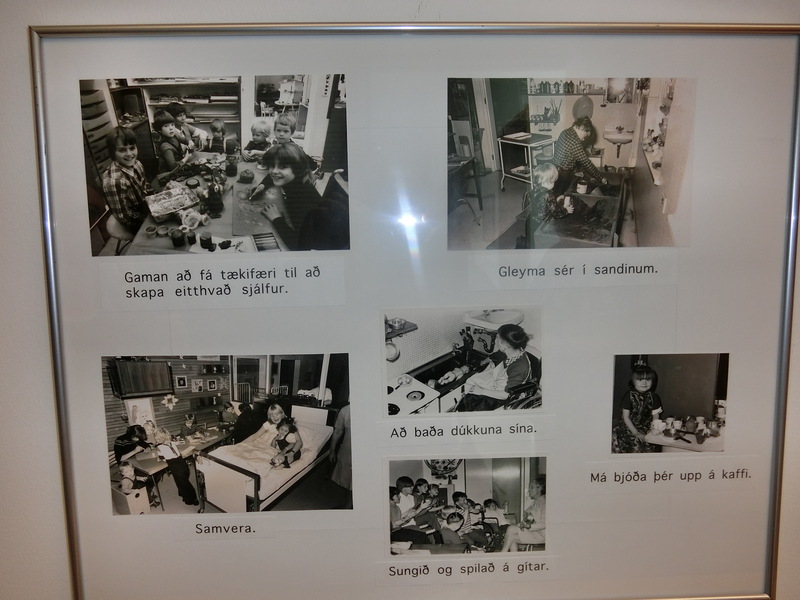 A kindergarten teacher who received training in Sweden and Oregon, she wrote a thesis on play materials to use with children. Sibba welcomed me to her playroom and proudly shared its history and resources, inviting me to sit down and play almost immediately. 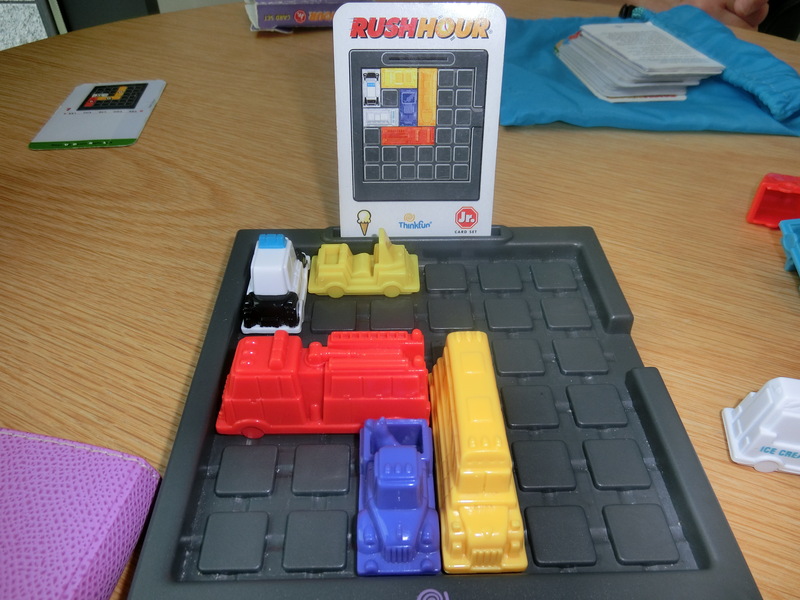 Here is the game of choice, Rush Hour. 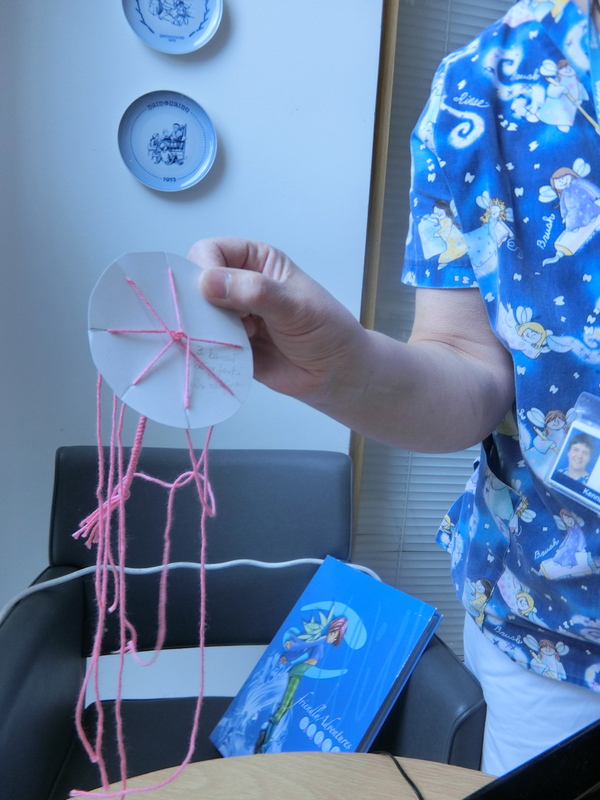 Sibba also demonstrated a wonderful little weaving craft (click on bold for video demonstration) that is perfect for children in isolation or those awaiting procedures. It’s a good craft for parents as well. Sibba’s resources are abundant. The room itself is spectacular, a giant window bringing natural light into a spacious, inviting and well equipped space. 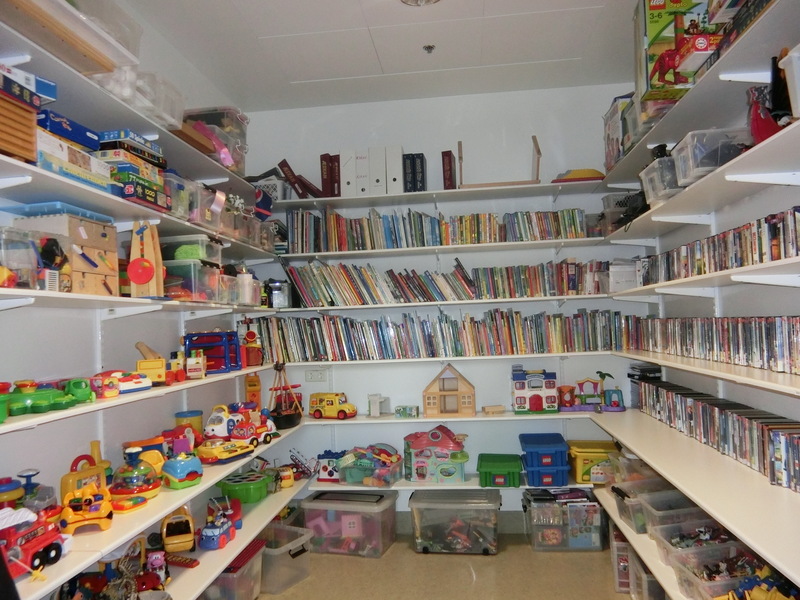 A huge walk-in closet is filled with books, dvds and toys that children can choose to play with in the playroom or at the bedside. The entire top shelf is devoted to books in other languages, since they serve patients from many countries. 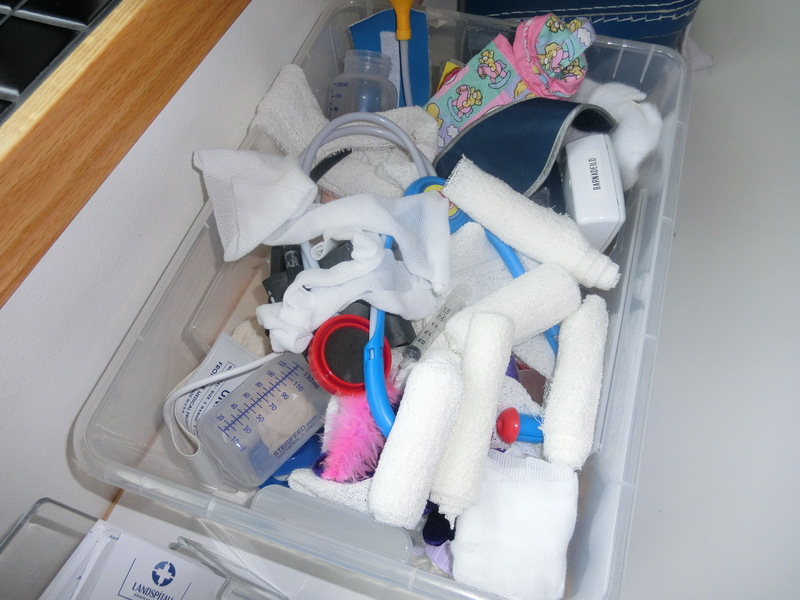 A shelf in the playroom office houses treasured therapeutic books that the specialists use one-to-one with children. 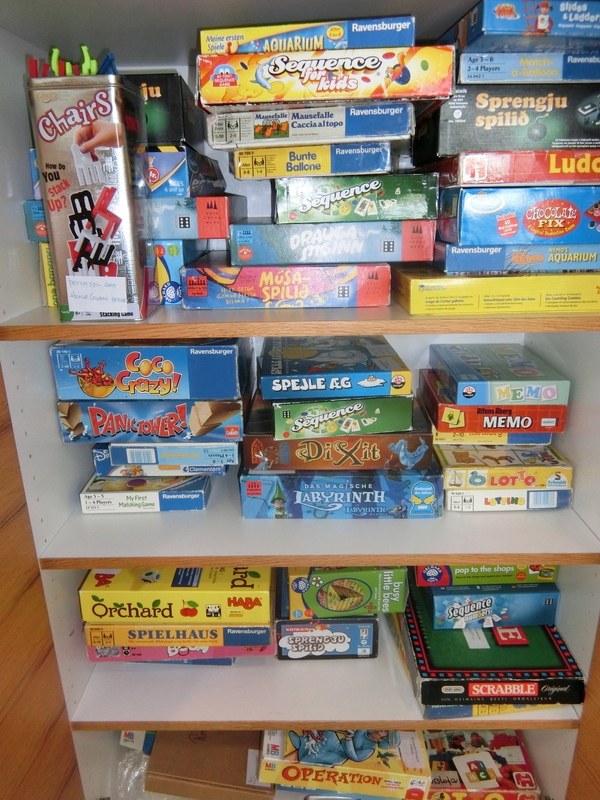 It was fun to see the board games in Icelandic – some of the same ones we have in the US, and many I’d never seen before. The room has two fish tanks with frogs and fish. The children feed and care for the animals during weekends. One frog is named Patch Adams after a beloved hospital clown and doctor who once visited the playroom. 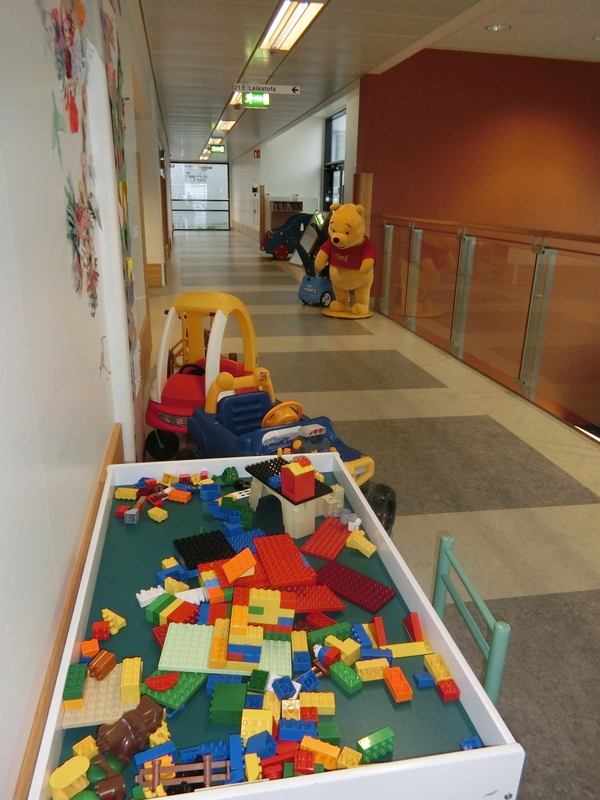 There is a medical play corner prominently displayed, and Sibba told me that children gravitate to it and play out their hospital experiences all the time. 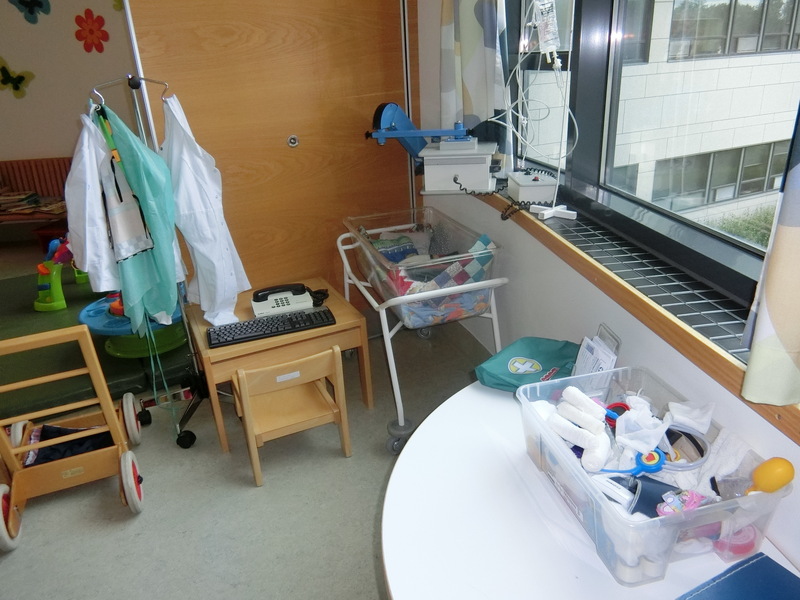 The play area includes a model of an x-ray machine, IV pole, doctor’s uniforms, a doll bed, a doll missing an arm (for amputees), and medical loose parts such as syringes, bandages and tubing. When children are discharged, Sibba always sends them home with a little bag of medical supplies so that they can play doctor at home. The play program was started by a woman in the 1950’s, much like our first play specialists in North America. Here are some photographs from that time. 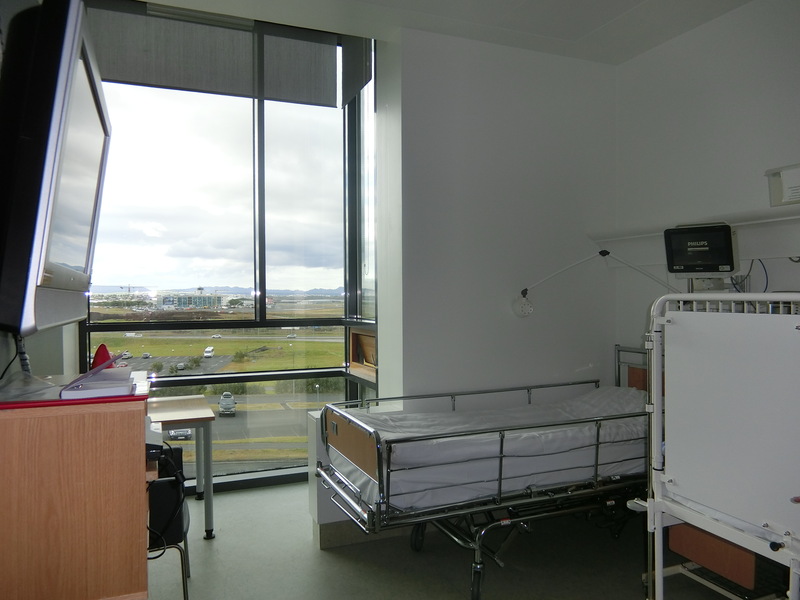 Patient rooms are mostly singles, with a bed or lounge chair for parents who wish to spend the night. The floor to ceiling windows let in much natural light. 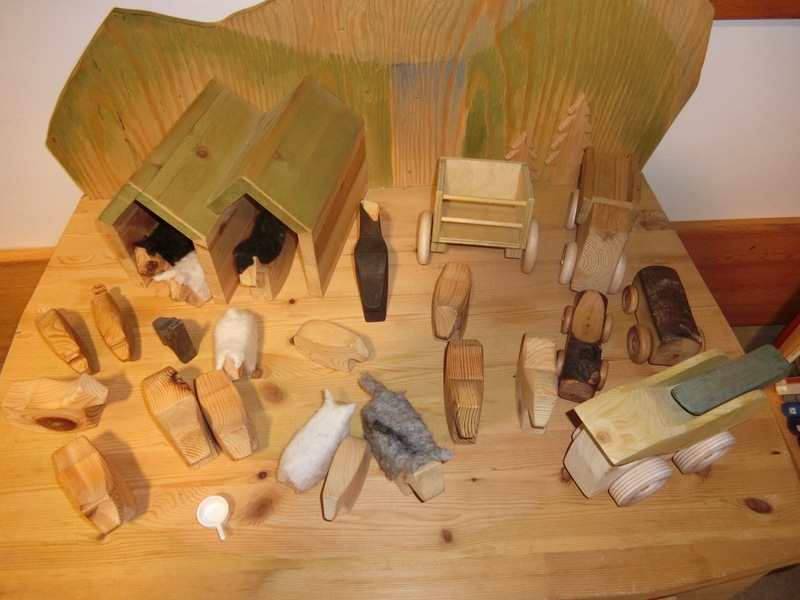 A handmade table farm, set against a volcano backdrop and including Icelandic animals, invites dramatic play. Sibba told of an organization that supports mentally challenged adults. They paid their clients to create this beautiful toy collection made of wood and yarn from Icelandic sheep. Perhaps my favorite item in the playroom (besides Rush Hour and the wooden farm) had to be this book: “The Story of the Little Mole who Went in Search of Whodunit”. 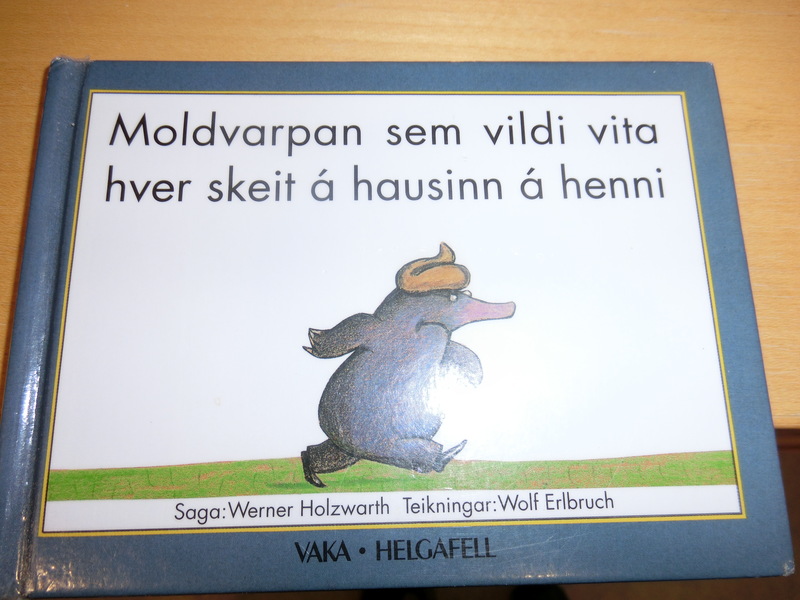 It tells of a mole who is trying to find out which animal pooped on his head. Perhaps you are not surprised by my attraction to this story. Thank you to Drifa and Sibba and the staff at Landspital for such a lovely welcome to your hospital and country. 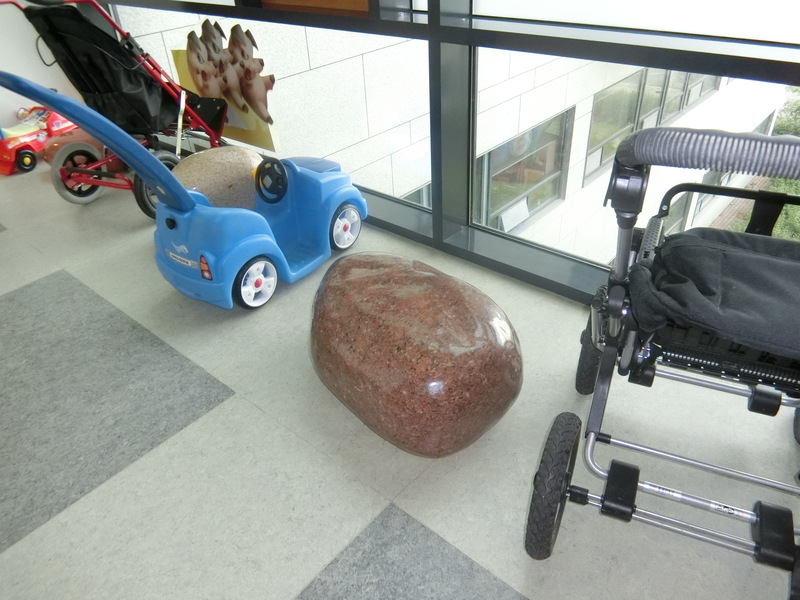 After a great morning playing and learning there, I was ready to set off on my own play adventure in the wilds of glacial pools atop the volcanos of Iceland. 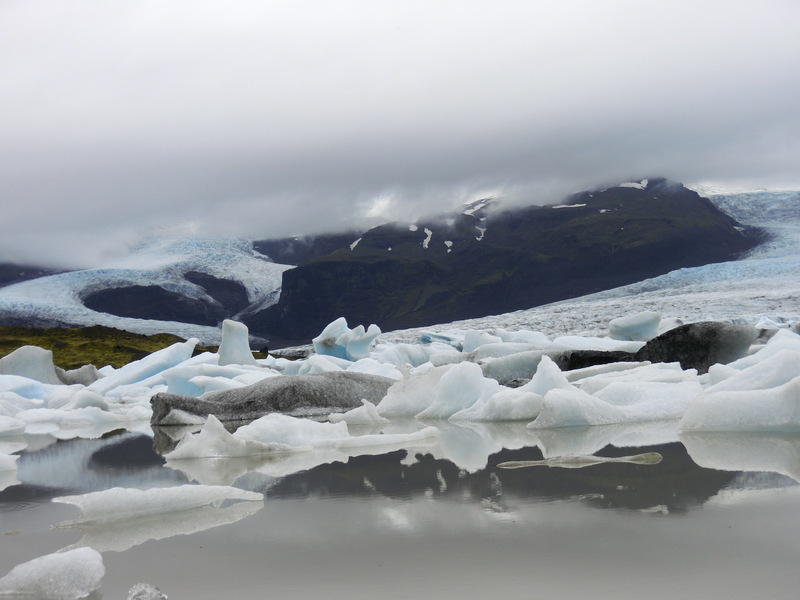 Enjoy the photo below taken at the Vatnajokull Glacier. 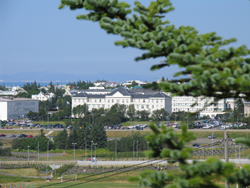 And here are six ways to say goodbye in Icelandic: bless, vertu sæll, vertu blessaður, verið þið sælir, verið þið blessaðir, kveðja við brottför. May God forgive me for not being able to pronounce any of them but the first! Next > Reach for It!